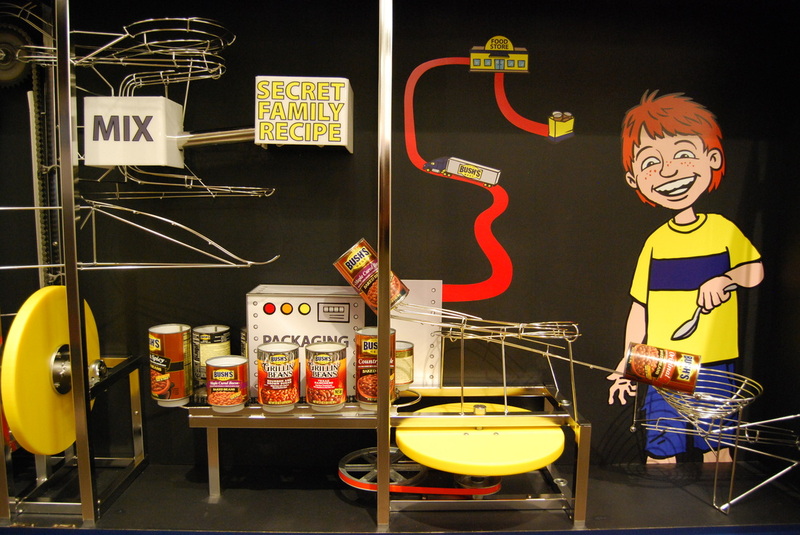 This Interactive sculpture shows the path of a Bush’s Baked Beans as it is harvested from the farmer’s field, cooked with the famous Bush Brothers secret recipe, and enjoyed by a hungry kid. 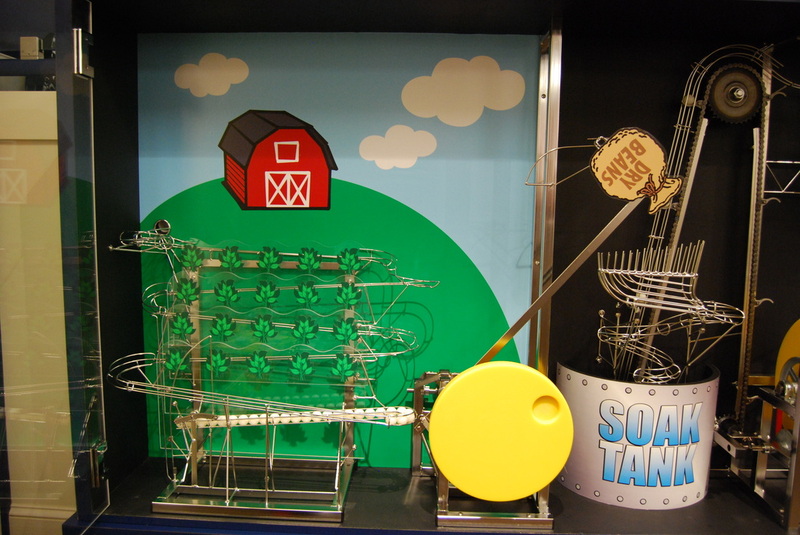 There are three interactive wheels that turn components inside the sculpture’s display case. 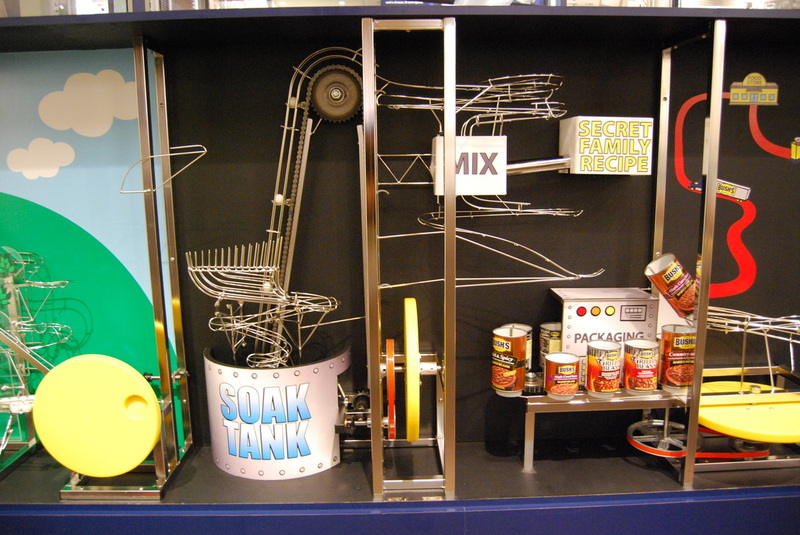 The first one operates a basket lift that pulls white beans from the field and sumps them into the soaker tank. The second wheel turns a chain lift that pulls the beans out of the soak tank and sends them into the secret family recipe mixing box where the white beans magically turn brown. The brown beans jump past the third interaction and into the waiting bowl of the hungry kid. 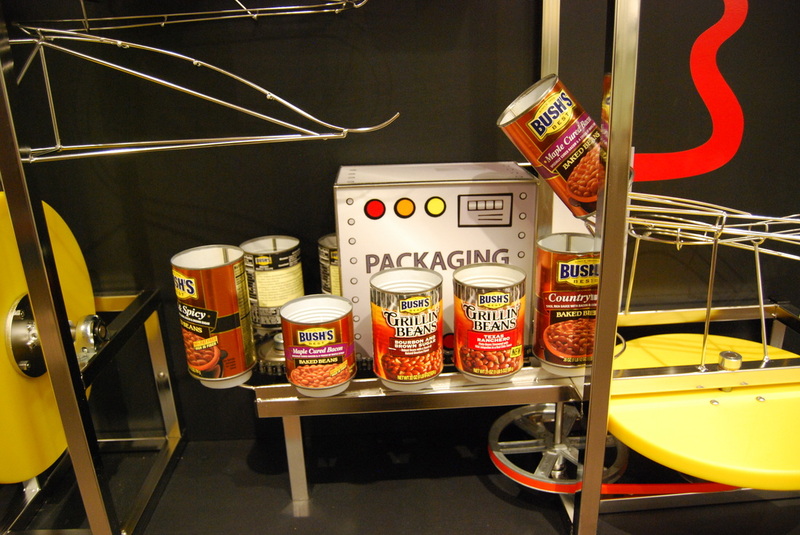 The third wheel turns the manufacturing plant conveyor to show off the many products of the Bush Bean Family. 1” diameter balls in white and brown to represent uncooked and cooked beans. Three interactions where the user turns wheels by hand. Three ball lifts; a Basket lift, a Chain Lift, and a Belt lift (Belt lift is motorized). Two separate track loops connected by a secret ball-changing mechanism. Highly-themed graphics to help tell the story of the Bush’s Bean Adventure. Custom display case with solid blue laminate and acrylic front panels. 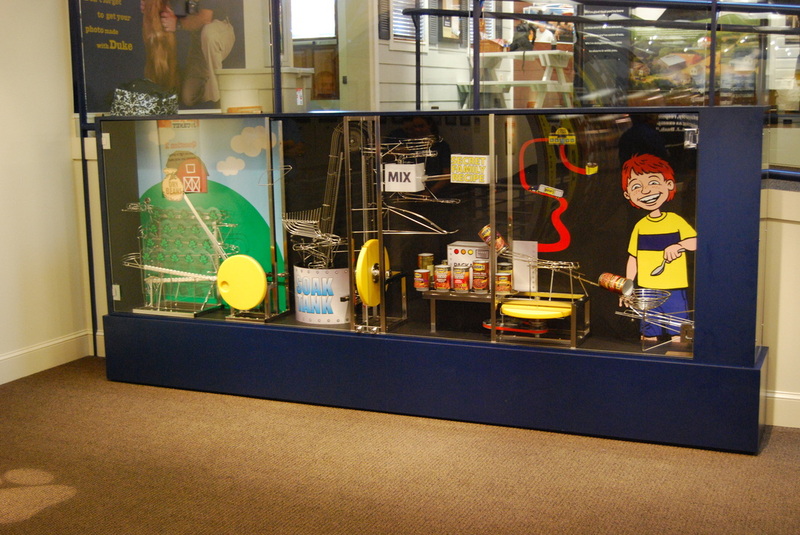 Bush's Bean Adventure Rolling Ball Sculpture shows beans traveling from the farmer's field to a Hungry Kid. Turning this disk rotates the "Dry Beans" bag from the farmer's field to the hopper of the soak tank, moving five balls with each pass. Turn the vertical disk to move balls out of the soak tank and mix them with the Secret Family Recipe. In the MIX box, the balls magically turn from white to brown. The balls jump into the can, through packaging, and dump into the kid's bowl. Turning the horizontal disk rotates the packing line to display some beautiful Bush's Best products.